Democratic candidate Abdul El-Sayed released a series of policy proposals on housing, municipal control, the economy and more on Monday. Abdul El-Sayed, a Democratic candidate for Michigan governor, released a series of urban policy proposals Monday, including plans to repeal the state emergency manager law, reduce prison sentences, strengthen housing protections for renters, incentivize “green” infrastructure and increase the minimum wage. El-Sayed said in his announcement that he hopes the initiatives proposed in the nearly 40-page document will combat critics’ charges that progressives aren’t rigorous enough on policy. He added that he hopes to mitigate concerns about the cost to taxpayers by “rethinking and tweaking policies” that already exist. 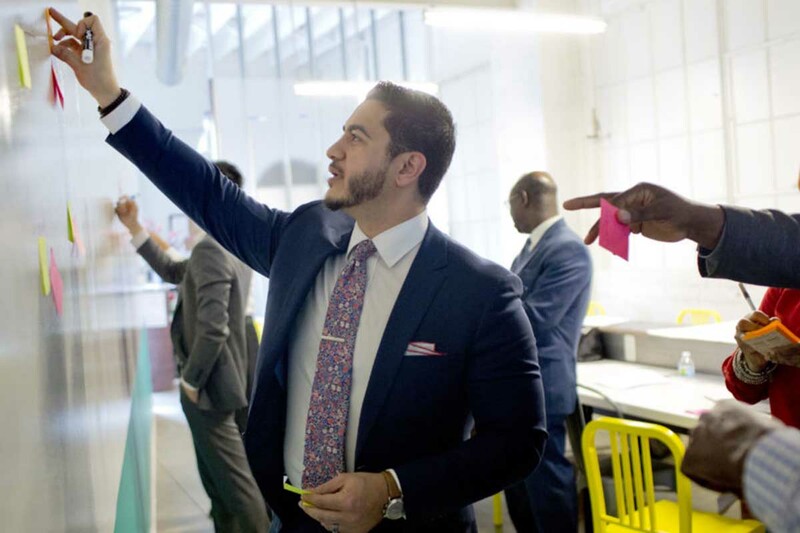 “This is not just a set of spending goals, but rather it is a way to rethink how a series of policies work together to empower cities and to empower our state overall,” El-Sayed told reporters Monday. El-Sayed, a Michigan-born, Ivy League-trained physician, is considered a rising star in progressive circles, entering the governor’s race after serving as chief of Detroit’s health department. Recent polling showed him still trailing Democratic frontrunner Gretchen Whitmer but in a nearly statistical dead heat with GOP favorite Attorney General Bill Schuette. Among other initiatives, El-Sayed proposes tuition-free college for students whose households earn less than $150,000 annually. He suggests reinstating the state’s Earned Income Tax Credit back to 20 percent of the federal credit, raising the state’s minimum wage to $15 per hour and replacing the state’s emergency management law with consent decrees with local legislators. His plan also includes broad changes to the funding structure for public transportation in urban areas, including plans to contribute portions of the Transportation Economic Development Fund — a state grant program intended for projects that would increase Michigan’s ability to compete economically — to public transit initiatives and proposals to allow cities to levy taxes on transit users in the area if approved by resident voters. El-Sayed said he is confident that even if Democrats don’t reclaim a majority in either the state House or Senate this year, voters would drive the Republican-dominated legislature to support his policies. El-Sayed said his campaign plans to release policy proposals on rural initiatives, education, the environment, healthcare and more in the coming months. Oh no....not another progressive liberal/communist!!! Their policies failed miserably. Why does anyone keep espousing the benefits of gov't running everything? Time to move on and leave the philosophy in the dust. People don't have to wait to see what will happen if the policies promoted by Dr. El-Sayed are ever implemented. They are in place RIGHT NOW in states like Illinois and California. And if you want to put the final nail in the economic coffin, go ahead and push for that $15/hr wage. You do realize per capita income is far higher in those two states than in Michigan? That the non-investment states, like Mississippi and Alabama, are among the poorest states in the nation? The test has been run. Michigan started cutting taxes in 2000. Since then, our per capita income rank has plummeted from 19th and near the national average to 32nd and 10 percent below the national average. Let's stop following the policies that make most people poor, and look at policies that can create new opportunities for more. You've got THAT right!! Raising minimum wage helps NO-ONE!! I just heard him in Grossed Pointe at the Unitarian Church, and I was impressed. Not only a good grasp of the issues and proposals but he puts them in a proper vision of the world we want for our children and grandchildren. He has the oration of Obama and the progressive vision of Sanders. But, he is only one man. We all need to work to make that vision a reality. No more 'saviours'. Raising the minimum wage is taboo for ALL Michigan residents. It not only drives the price up on all goods and services, but also decreases the value of the paycheck of workers that make more than minimum wage. I'm not for this! !